WoodBarrels sells wooden barrels handmade according to traditional techniques, as well as other cooperage products like wooden tankard, buckets and butter churns. We also make and sale wooden wine accessories like wooden wine racks and wine boxes. And wide range of wooden planters. WoodBarrels has already been trading for about eight years, slowly becoming a highly successful and growing online business. 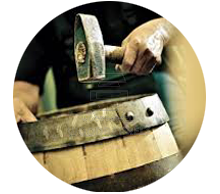 Discover the world of handcrafted Cooperage Wooden Products. In our workshop we make use of the latest machines but some things are still best to be done by hand, accoring to the old way. As well as standard products We also offers a wide range of bespoken product, so if you cannot find on our website exactly what you are looking do not hesitate contact us. We get many requests for personalization products and we are more than happy to do so. We use a few techniques for engraving corporate logos, marketing slogan and whatever else our customers want or need. We deliver to most of European countries via DPD couriers standard 3-4 working days service. We also deliver to Canada and USA. Coopering was once a vivid profession delivering any possible wooden vessels made of wooden staves (with casks or barrels being only of two them), used in all forms of trade as a main way of storing goods. But after cheap metal containers were introduced in the nineteenth century, coopering went into decline. Nowadays, cooperage workshops are usually small, family run businesses, producing one or just a few types of products. As WoodBarrels, we have formed an association of master coopers to advance and promote the craft of coopering in all its forms. We’ve also wanted to promote coopers and their work to a wider audience. We find, that basing our main activities on line, makes coopering products much more accessible. We can also offer wider and varied range of traditional hand-made wooden products from different sources, so one can find here on our web site not only barrels, but wooden planters, wooden buckets, tankards or beer steins, butter churns, as well as wooden bath tubs. We hope that our efforts can help to keep this rare profession alive and true craftsmanship in demand. We have an outstanding reputation for manufacturing and supplying top quality coopering products and wood components. Our design and manufacturing teams are well-skilled and turn your creative ideas into reality. We control the complete manufacturing process from timber selection, and product creation, right through to sanding, finishing and product dispatch. 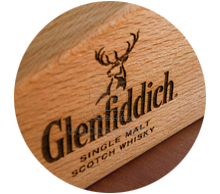 Our business has grown to supply well known companies (Bacardi, Glenfiddich, AMT coffee among others) at the same time serving the needs of small businesses with bespoke goods in large and small volumes. The finishing is done manually, trying to enhance the unique characteristics of each individual piece. Our main products that we are selling most are unique hand crafted oak barrels, display barrels and barrel displays, wooden buckets, planters, and store fixtures. We also offer a full range of display cases, display racks, display shelves, and point of sale displays. Our wooden display products are great for small businesses, bars, restaurants, shopping centers, health clubs and everything in-between as well as for very big retailers and wine producer’s. 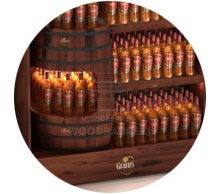 Display barrels are great idea for point of sale displays used at retail business attracting attention to your brand. Apart of that we have full range of high quality wooden tubs. Whether you are looking for an outdoor hot tub or an indoor bathtub (like Japanese ofuro bath tubs), you have arrived at the right place. As well as standard products, WoodBarrels also offers a wide range of bespoken wooden tub. We will consult on all phases of your project, from selection of the best tub for your project to the installation details.